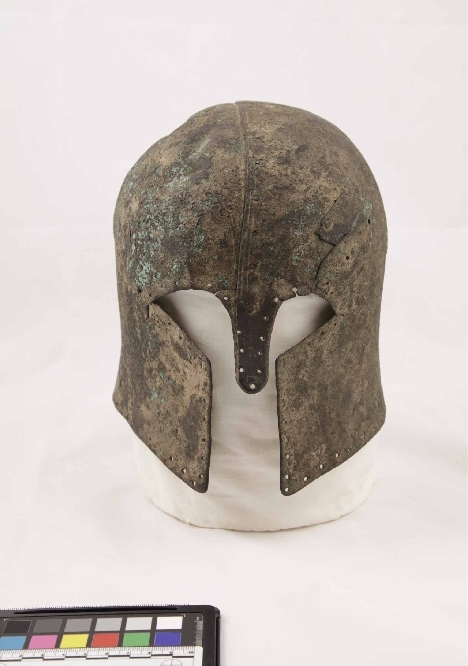 This paper will present new conclusions about the development of ancient Greek military equipment and a deeper understanding of ancient Mediterranean metalsmithing. In the summer of 2017, I studied a Proto-Corinthian helmet at the Hearst Museum, object 8-4597, with an X-Ray Florescence (pXRF) spectrometer. Although ancient historians and classical archaeologists often cite object 8-4597, very little is actually known about this object. It is archaeologically unique and iconographically unattested. Previous authors have speculated as to when the object was constructed, where it was excavated, and how it fits into our linear model for the development of ancient military technology. The pXRF cannot definitively answer these questions, but it still provides valuable information about the objects production history, its crafter, and consumer. I will argue that object 8-4597 dates to a key moment in the metallurgical history of bronze armor in the ancient Mediterranean. At a time when low-skilled smiths used rare metals and a remarkable amount of manual labor to produce an inherently flawed but flashy object, which they fully expected to break. In other words, it probably dates to the first generations of the Ancient Greek hoplite revolution.